Do you love biking, exploring and a little adventure on your holiday but not quite ready to tackle what corfu has to offer alone? No worries, our experienced guides will take you all across the beautiful terrain Corfu has to offer, at the pace that's right for you. We have several bicycle tours and excursions that will fit a wide variety of fitness and skill levels - we'll take care of everything! The tour departs from S-Bikes, in Acharavi at 9:00 am and returns around 2:00pm - Please be on time. Maximum group size is limited to 8 people for the comfort and safety of everyone. Half days and private guided tours are also available, please contact us for further details, including pricing and availability. As always, weather and track conditions are always a factor when biking. We will do our best to inform all our guests about changes to the tours. Thank You. Ready for adventure! The Mountain Tour takes advantage of Corfu's towering and beautiful Mt. Pandokratoras (1,000m+) which over shadows Corfu's North-East coast. The tour starts atop the ancient Monastery of Pandorkrator and explores a huge range of tracks, trails, fire breaks, goat paths and paved roads, not to mention some of the most breath taking views one could ever imagine, including Grava cave. Additionally, there are ancient ruins, olive groves, historical sites and the 14th century village of Old Perithea (Heritage Site), for rest and refreshments. Transport is provided by S-Bikes, to the top of the mountain. Some mountain biking experience and a good fitness level is necessary for this tour. Based on group size and experience, the tour can be altered to fit the customer's desired skill level. Please contact us with questions. S-BIKES CORFU - The Easy Mountain tour from s-bikes on Vimeo. The tour departs from S-Bikes, in Acharavi at 9:00 am and returns around 2:00pm - Please be on time. Maximum group size is limited to 8 people for the comfort and safety of everyone unless additional tour guides are added. Half days and private guided tours are also available, please contact us for further details, including availability. Thank You. The tour departs from S-Bikes, in Acharavi at 9:00 am and returns around 2:00pm - Please be on time. Maximum group size is limited to 8 people for the comfort and safety of everyone unless additional tour guides are added. Admission to the Acharavi Folklore Museum included with this tour. Half days and private guided tours are also available, please contact us for further details, including availability. Thank You. Want to explore Corfu on your own, why not go solo! Let S-Bikes provide you with everything you'll need to have the adventure of a life time. Our large selection of high quality bikes, safety equipment, maps, routes and experience is all you'll need to explore. Stop by our Acharavi store location and we can assist you in whatever holiday adventure you have in mind. 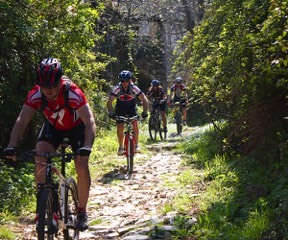 Corfu's extensive terrain and breathtaking vistas make biking a perfect holiday activity. Contact us for details by clicking here.